Dusting a passport off for a two-week trip in Western Europe means things are really happening. It isn’t all the planning and booking hotels, flights, or train tickets. Filling up a map with must-sees and must-dos makes me overflow with excitement, but something doesn’t seem real until the passport comes out. The first stop on our journey was Brussels and my research showed glorious promises of tender beef in velvety gravies with pomme frites and generous dollops of mayonnaise, the birth and death place of art nouveau architecture, and wild fermented beers with regional terroir, but all of the research couldn’t prepare me for what I discovered. Walloons are effortlessly hospitable. A brief background. Fleming and Walloon are the two dominate cultural groups in modern Belgium. The Flemings live mainly north and west and the Walloons, who speak dialects of French, largely live south and east. Outside Mons, a small town near the French border there is a brewery called Brasserie de Blaugies started in 1987. A family-run business, Pierre-Alex and his wife, Mary-Noëlle, brew saison beers while their children run a tavern restaurant across the road from the brewery. Pierre-Alex showed us the brewery, their home garage with tanks on slender metal legs that reach the ceiling and look like giants squatting in a room far too small for them. As we talk in the sweltering garage, their dog runs circles in the driveway outside and the day slowly falls. That night we sat down to wonderful steaks and pomme frites for dinner on their restaurant patio, cooked and served by his family. Even the ice cream came with a bright blue foil pom-pom on a toothpick – it was a celebration so small and so delightful that I kept that pom-pom because it encompasses the way the family treated us on our visit to their brewery. Pierre-Alex, the master griller. One of his many titles. We learned that morning Pierre-Alex had an early rise to prepare horses for the town’s annual festival. It’s the quintessential George and the Dragon folklore that many claim as their own, but this town’s version is with a dragon named Doudou. Scattered through town we found Doudou shaped cakes, Doudou printed tee shirts and Doudou stuffed animals. Pierre-Alex starts the celebration by leading horses up the steep Rampe Sainte-Waudru while the town pushes the dray loaded with a gilded shrine from behind. On that same day, Pierre-Alex spent his afternoon bottling beer for packaging and cooking steaks over an open fire grill for his guests. Even as we made our slow jaunt to the door, out of energy from our long day, he was playing with his grandchildren in the dining room and joking with us, not showing any sign of exhaustion. That June day was so long and his day so full, but it wasn’t work. It’s his life, family and home he shared with us. As if it couldn’t get any better, the following day we ventured between oat fields and big red poppies along the roadside to Au Baron, another brewery across the French border. The most picturesque leg of the trip was first laying eyes on Au Baron. In an almost town square-like planning, the country road turned into a big cul-de-sac with houses in the round, Au Baron by far the biggest and most prominent in its position to our arrival. Slightly off-centered left of the approach with a steeply pitched gable roof and all brick façade, the minimal roof overhangs stood prominently in contrast to the quirky letters dancing along the gable end forming the words ‘Au Baron’ with the ‘r’ unhinged and tilted oddly out of line. In front and through the cul-de-sac runs the Hogneau River lined with grass-covered rocks and overgrown foliage. Xavier greeted us, the grandson of the original brewer and who now runs much of the operations. 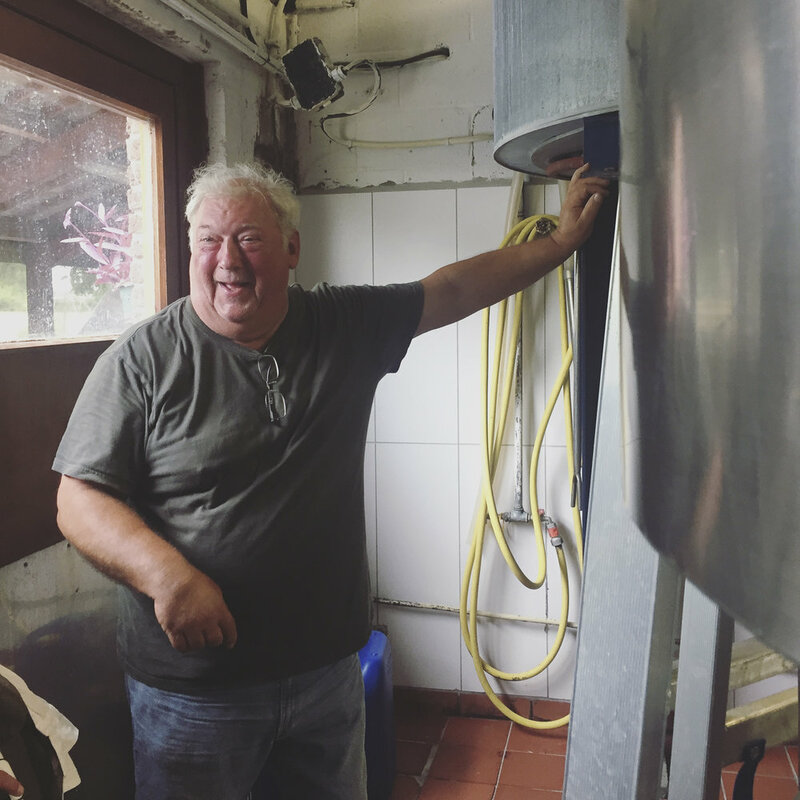 Like Blaugies, the brewery is also family-run. Xavier’s sister is at the restaurant helm and their father still brews and manages operations. The brewery only makes 4 beers regularly and in the states we only see one imported, Cuvée de Joanquille. The other three we tried that day were equally delightful, enjoyed on the outdoor patio over Carbonnade Flamande, a regional favorite meal of beef stew made with beer-based, slightly sour gravy served with pomme frites. Xavier took time away from work to show us their brewery and tell us about their brewing process. He seated us on the patio and brought out their beers slowly in a series, showing us how they should be enjoyed. I wanted to stay at Au Baron because time seemed to be on our side, what was vacation for us was this family’s way of life they shared on the patio overlooking the river. Birds argued overhead, cats lazily walked around looking for field mice and locals took drag after drag of French cigarettes on their Sunday. As we were leaving, we had a chance to meet Xavier's father Alain and thank him for the special attention they reserved for us that day. We offered to host them anytime the family comes to Seattle in the future. I only hope we can show the same sort of hospitality they showed us on our visit. Expectedly we thought we were going to Brussels to talk to brewers and drink a lot of beer. Knowingly we were going to spend many days seated outside enjoying the sidewalk cafe culture. But what we continue to steep on, are Walloons and their hospitality. How, as a brewery, can we offer the same level of thought and hospitality to customers who will come taste our beers? Living up to the standard set by our Belgian counterparts will no easy feat. We salute you BXL for all that you are! Heather Pogue is an architect in Seattle and designs single family and boutique commercial projects and will be designing Fair Isle’s tasting room and brewery. You’ll be hearing from her more when we secure a space and begin build out.